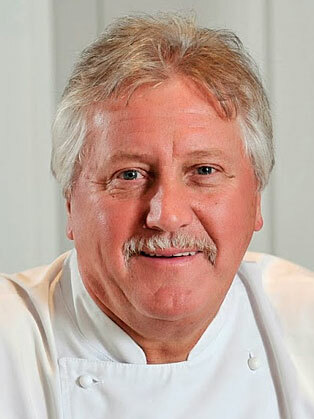 Brian Turner CBE is said to be one of Britain’s most well-known chefs having trained at Simpson’s in the Strand, The Savoy, The Beau Rivage in Lausanne and Claridge’s. In 1971 he opened the kitchens of The Capital Hotel with Richard Shepherd where they won a then rare Michelin star. In 1986 he opened his own restaurant Turner’s in Walton Street, Chelsea. After fifteen years of success he opened restaurants in Birmingham and Slough and in 2003 at The Millennium Hotel in Grosvenor Square, Mayfair. Now he only has Turner’s in Butlins, Bognor Regis. Turner is the President of the Royal Academy of Culinary Arts which he has combined with a successful career as a TV personality. Having been on the first ever Ready Steady Cook Show Turner served 14 and a half years on the very successful programme as well as many appearances on This Morning, Saturday Kitchen, Daily Cooks Challenge and many others over the years. In June 2002 in the Queen’s birthday honours list Turner was awarded a CBE for his services to tourism and training in the catering industry. Since then Turner has been made an Honorary Professor of The University of West London, a Fellow of the City and Guilds of London Institute as well as receiving Honorary Doctorates of Science at Leeds Metropolitan and Sheffield Hallam Universities. Most recently Turner has received an Honorary Apprenticeship Award which he feels complements his work with the Adopt a School scheme and the Future chef competition which both encourage young people to come into the catering industry. Brian is the Ambassador for leading cooking brands, Stoves and Belling, playing an active role in campaigns to encourage British people to get back into the kitchen cooking and using his extensive experience of the working kitchen to help with innovative new product development.